If you don’t like the look of bare tin, or it just doesn’t fit in with your room’s décor, you can do something about it. It’s not much harder to paint than any other surface. Remove as much furniture as possible from the room to avoid splattering it with paint. Cover the floor and any pieces of furniture that are too heavy or cumbersome to move with drop cloths. Remove the curtains and draperies. Painting a ceiling can be messy. You can’t skip the priming step. The paint will peel otherwise. An oil-based primer is recommended for metal. Pour a bit of this into a paint tray and roll a paint roller through it. Start at one end of the room and work your way across. When you’re done priming, let it dry. 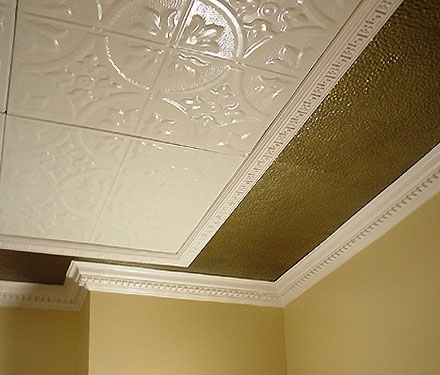 To paint your tin ceiling, simply repeat the steps above using paint instead of primer. Cover all of the embossed areas of the panels using a thick roller cover designed for a textured area. Server responsed at: 04/22/2019 4:21 a.m.